A tapa is simply the best thing to nibble on as you toast with your glass of wine or beer in a Spanish bar. The tapas have become an unmissable part of Spanish culture and we are taking this opportunity to give you six delicious reasons to try the Spanish tapas. Spanish clams are vey large, specially in the North, and they are one of the greatest Spanish delights . If you are unfamiliar with this tapa, then this is a delicious way to try it out. We are talking about a typical Mediterranean style dish with a slight arabic twist of spices. Spanish clams are served with plenty of fresh bread to mop up the savoury juices. The stuffed mushroom tapa is very easy to prepare and simply delicious to the taste. The button mushroom tops are removed, then the mushrooms are filled with olive oil, garlic and bits of Iberian ham and left to cook on the grill. Another unmissable Spanish tapa which is great for a cold weather day. This extraordinary tapa never leaves anyone disappointed. The Iberian Acorn Ham is a ham produced exclusively in Spain, awarded with Spain's Denominación de Origen and made from a famous and a legendary race of Spanish pigs called Black Imperial pig. The Iberico ham is a very expensive one and has become widely known all over the world. Bacon can improve almost any recipe and the Spanish love it. This popular combination of dates and bacon can be found at most tapas bar, as well as in many banquets and receptions. It is very easy to prepare and will make an ideal treat for your guests when throwing a party at home. 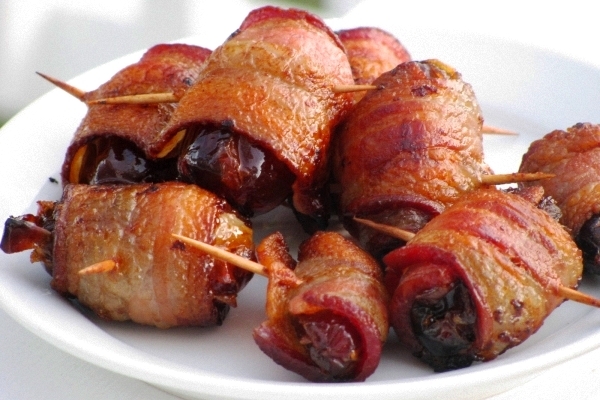 This tapa is just what it sounds like: a date wrapped in bacon and then cooked on the grill until the bacon is crispy. Any tapa made with Spanish chorizo sausage has to be good! Spanish chorizo sausage is tasty by itself and is used as an ingredient in many Spanish dishes. Uncured chorizo is needed for this particular recipe. Here, the classic Spanish sausage is simmered in cider until tender and cooked through. The result is a perfect tapa for the winter. "Boiled octopus Spanish style" or "Pulpo a la gallega", as it is called in Spanish, is one of the most popular tapas throughout Spain. It is usually served on wooden plates with boiled potatoes. This tender and mouthwatering tapa is truly one of the dishes preferred by the Spanish food lovers. You can enjoy any of these tasty tapas in the many bars and restaurants located near the beaches of the Costa Blanca. Why wait until summer to come and find your holiday home in Orihuela Costa, Torrevieja or any of the many areas we have available? Call us now and let us help you find it!